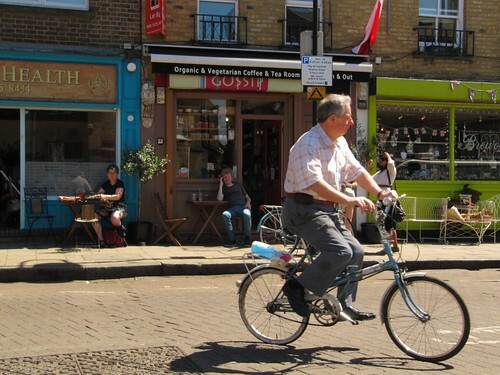 Last weekend the sun came out to play in London's lovely East End; it's amazing what a dab of sunshine will do, even the drabbest of corners become a playground or a cool, shaded hang out. 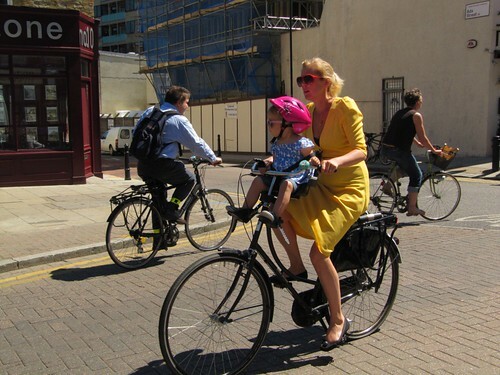 And London's cyclists were out in force, just doing their thing in their sunshine. No need to hurry, no need for high-viz vests and all those other trappings. Just bikes, sun, and fun. What more do we need to sell just how good bikes can be? All these photos and many more can be found at my Flickr profile. Sun? Where? I envy you :-). Lovely shots, seems like a really peaceful atmosphere. These photos are making me smile and smile. That's SO not how I think of London (having mostly only been there in autumn and winter months)--here it looks a bit like San Diego with cobbles! The cow-patterned rubbish bins are festive, by the way, aren't they? What a great post. Thank you for the delightful visit. Wonderful photos! It's so great what happens on the first sunny day of the season! Love the short sleeves, shorts and sundresses! @Anne, the cow bins are great, they're recycling bins for the market. 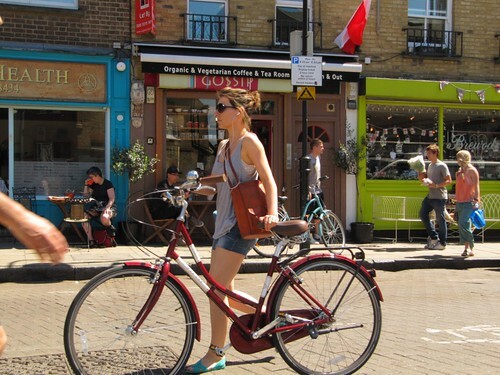 The girl in the photo with the bins is the first person I've seen riding one of these stud-line tyre beach cruiser type bikes in London. Maybe a new trend? Mark, those beach-cruiser style bikes are a popular rental bike around here, and seem to have tremendous appeal to people who haven't been on a bike since their youth. It wouldn't surprise me if they were becoming trendy. They're cute to look at, fun to ride, and look great under attractive young men and women! Fantastic photos! It seems a heat wave has hit London. I wish it would here....it's still chilly and I wear gloves in the morning. Do you know what brands of bikes are the red ones in your photos (2nd from top and 5th from top)? Bring on the hot weather, bikes and dresses! Hi Judy, thanks for stopping by. I've tried to look at the pictures of the bikes you mentioned up close but I'm afraid I can't tell what make they are; sorry! 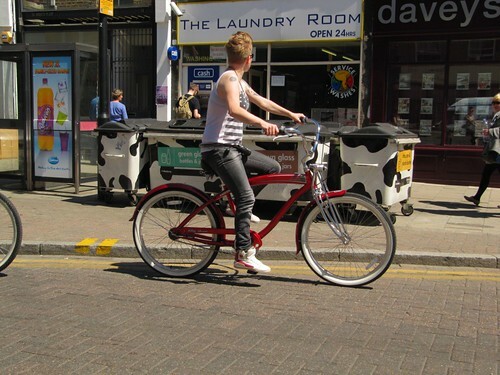 The red 'Dutch' bike is especially good looking and the beach cruisers seem to be getting more popular here too. I think everyone is ready for the summer! There's something about summer clothes and bicycles that wallpapers over a hole in the normal streetscape. London looks a good place to be right now. Oh man - loving these! I've seen riding one of these stud-line tyre beach cruiser type bikes in London. Maybe a new trend? Looks aren't the only thing this cruiser has though. It wouldn't be a sixthreezero without the smooth cruise configuration, so you know it will not only look great, but it'll give yopu the smoothest and easiest ride possible California Bikes. Best of all, you will know that you can get extra money, every month, any time you want, just by completing surveys and offers for free.